Or Yehuda, Israel, November 13, 2012 – Formula Systems (1985) Ltd. (NASDAQ: FORTY) a leading provider of software consulting services, computer-based business solutions, and proprietary software products, today announced its results for the third quarter of 2012. Revenues for the nine-month period ended September 30, 2012, increased 13% to $546.5 million compared to $483.3 million in the same period last year. Operating income for the nine-month period ended September 30, 2012, increased 8% to $41.9 million compared to $38.8 million in the same period last year. Non-GAAP operating income for the nine-month period ended September 30, 2012, increased 21% to $52.5 million compared to $43.3 million in the same period last year. Net income for the nine-month period ended September 30, 2012, increased 27% to $16.5 million, or $1.18 per fully diluted share, compared to $13.0 million, or $0.94 per fully diluted share, in the same period last year, excluding income of $25.8 million recorded in the nine-months period ended September 30, 2011 in connection with the acquisition by Sapiens International Corporation N.V. of IDIT I.D.I Technologies Ltd and FIS Software Ltd on August 21, 2011. 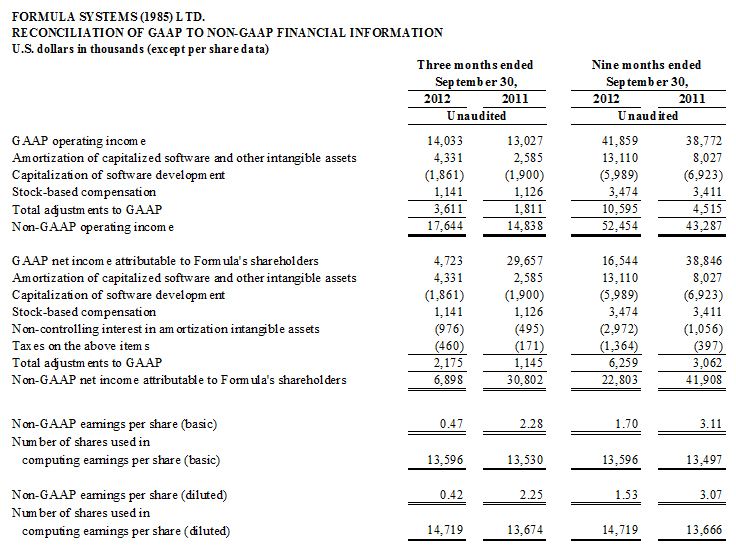 Non-GAAP net income for the nine-month period ended September 30, 2012, increased 42% to $22.8 million compared to $16.1 million in the same period last year excluding $25.8 million recorded in the nine-months period ended September 30, 2011 in connection with the foregoing acquisition by Sapiens. Consolidated cash and short term and long term investments in marketable securities totaled approximately $130.0 million, as of September 30, 2012. 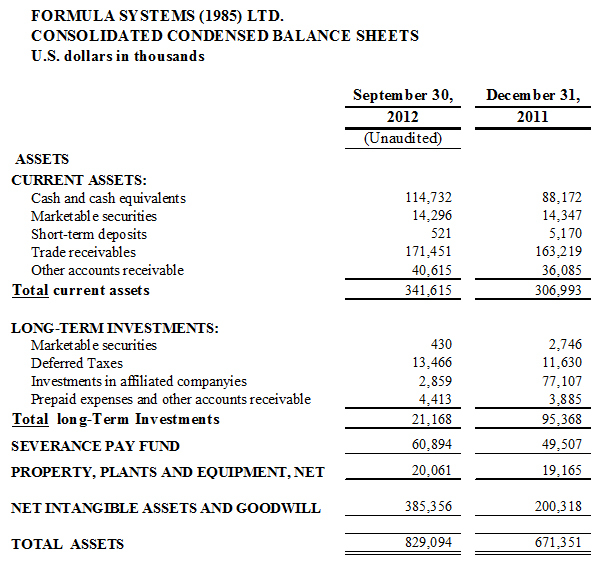 Total equity on September 30, 2012 was $455.3 million, representing 55% of the total balance sheet. Revenues for the third quarter ended September 30, 2012, increased 13% to $182.0 million compared to $161.5 million in the same period last year. Revenues for the third quarter of 2012 were negatively affected mainly by the devaluation of the U.S. dollar versus the New Israeli Shekel and the Euro in the amount of approximately $16.0 million in comparison to the same period last year. Net income for the third quarter ended September 30, 2012, increased 23% to $4.7 million, or $0.33 per fully diluted share, compared to $3.8 million, or $0.28 per fully diluted share, in the same period last year, excluding $25.8 million recorded in the third quarter ended September 30, 2011 in connection with the foregoing acquisition by Sapiens. Net income for the third quarter of 2012 was negatively affected mainly by the devaluation of the U.S. Dollar versus the New Israeli Shekel and the Euro in the amount of approximately $0.5 million in comparison to the same period last year. Non-GAAP net income for the third quarter ended September 30, 2012, increased 39% to $6.9 million compared to $5.0 million in the same period last year, excluding $25.8 million recorded in the third quarter ended September 30, 2011 in connection with the foregoing acquisition by Sapiens. Formula’s management believes that the purpose of such adjustments is to give an indication of Formula’s performance exclusive of non-cash charges and other items that are considered by management to be outside of our core operating results. This non-GAAP financial measures are not in accordance with, or an alternative for, generally accepted accounting principles and may be different from non-GAAP financial measures used by other companies. In addition, these non-GAAP financial measures are not based on any comprehensive set of accounting rules or principles. 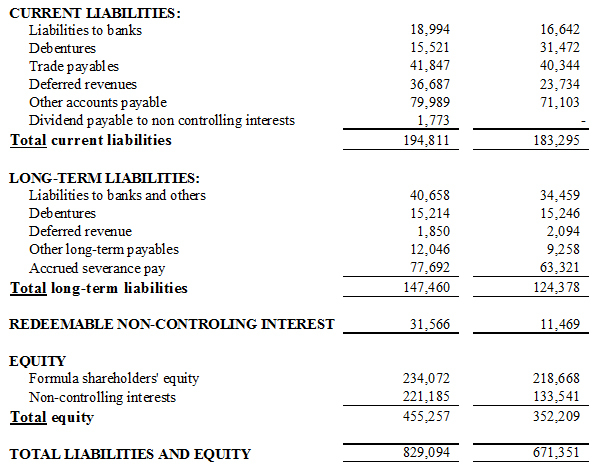 Formula believes that non-GAAP financial measures have limitations in that they do not reflect all of the amounts associated with Formula’s results of operations as determined in accordance with GAAP and that these measures should only be used to evaluate Formula’s results of operations in conjunction with the corresponding GAAP measures. Please refer to the Reconciliation of Selected Financial Metrics from GAAP to Non-GAAP tables below. 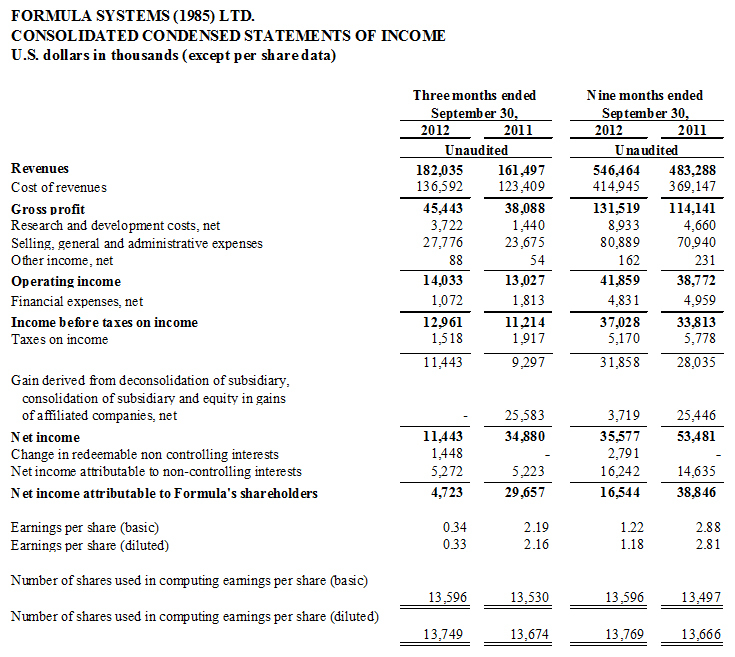 Formula Systems (1985) Ltd. is a global information technology company principally engaged, through its subsidiaries and affiliates, in providing software consulting services, developing proprietary software products, and providing computer-based business solutions. For more information, visit www.formulasystems.com. Except for any historical information contained herein, matters discussed in this press release might include forward-looking statements that involve a number of risks and uncertainties. Regarding any financial statements, actual results might vary significantly based upon a number of factors including, but not limited to, risks in product and technology development, market acceptance of new products and continuing product conditions, both locally and abroad, release and sales of new products by strategic resellers and customers, and other risk factors detailed in Formula's most recent annual report and other filings with the Securities and Exchange Commission. These forward-looking statements are made only as of the date hereof, and the Company undertakes no obligation to update or revise the forward-looking statements, whether as a result of new information, future events or otherwise.